After Kevin Prince threw three straight Interceptions against Texas, fans wrote him off and declared Richard Brehaut the team’s only hope at Quarterback. But on Saturday night at the Rose Bowl, Brehaut got seriously injured, and watched on crutches from the sidelines as Prince made a lot of haters eat some crow. 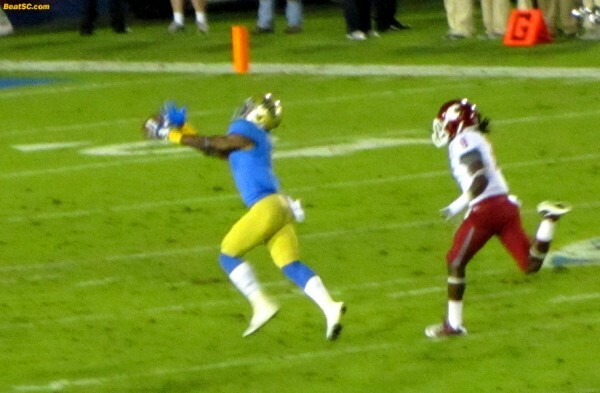 Prince made the most of his sudden and unexpected opportunity, hitting long passes, short passes, do-or-die passes, and, or course making several big runs to guide the Bruins to a big win in a must-win situation. Prince wasn’t perfect, overthrowing a couple of balls that both would have been TD’s and underthrowing Nelson Rosario in the end zone which resulted in an Interception right before Halftime. But overall, Prince outperformed ALL expectations, especially with his clutch plays in the 4th Quarter. 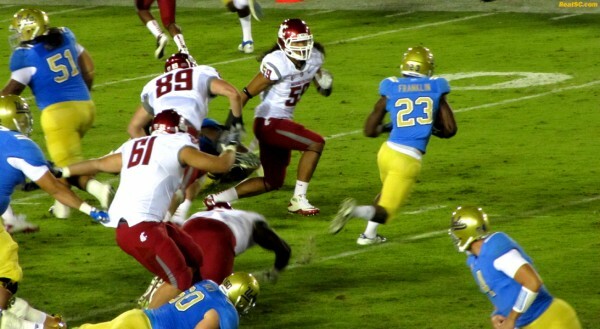 Washington State, who is Nationally-ranked in Offensive production this season, had no trouble moving the ball on the decimated Bruin Defense. 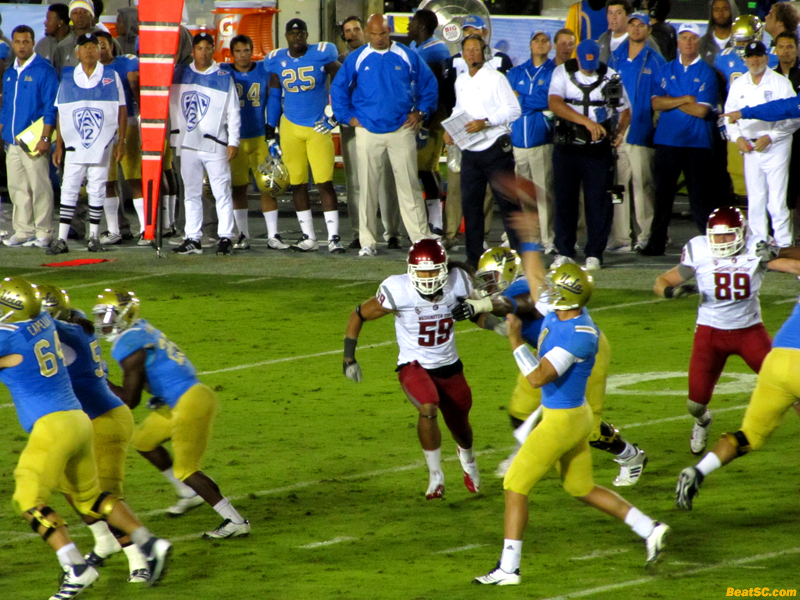 Quarterback Marshall Lobbestael dissected a Defensive backfield that was missing Tony Dye, Sheldon Price, and Alex Mascarenas, and the Cougars also piled up yards on the ground, despite the best efforts of of Sean Westgate, who was playing with a broken hand. 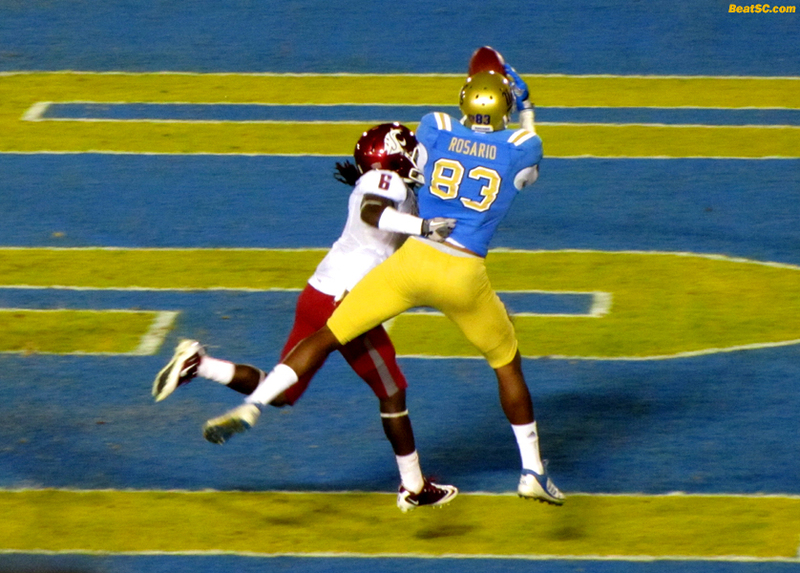 But the Bruins stiffened in the red zone, with Dalton Hilliard, Eric Kendricks, and especially Aaron Hester making big plays to keep the Cougars at bay. WSU had to settle for Field Goals the first three times they threatened, so despite the Bruin struggles, including several stupid personal foul penalties, UCLA trailed only 9-7 at the Half. It was 6-0 when Brehaut went down, and Prince promptly drove the team (via one bomb to Nelson Rosario) to a TD and a 7-6 lead. 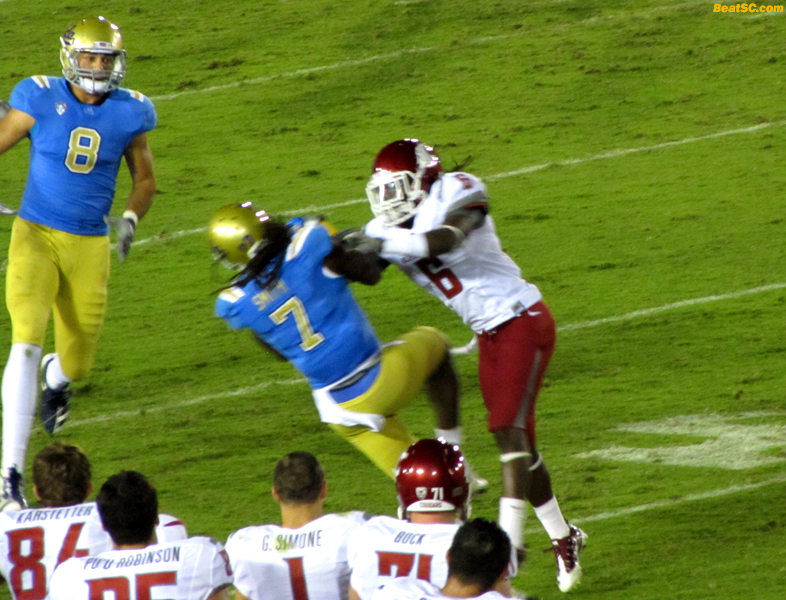 But WSU kicked another FG, followed up by the end-of-half INT by Prince). The Bruins took the lead back in the 3rd, on Derrick Coleman’s 2nd short TD run, but WSU answered to make it 16-14. They scored early in the 4th and were about to make it a two-possession game, but Owa blocked the PAT, keeping it 22-14. Helped greatly by the stellar running of Jonathan Franklin, Prince got the Bruins back in the end zone, with a nifty pass while on the move to Josh Smith, but the 2-pt conversion failed, leaving the Bruins down by 2. WSU moved down the field again, but couldn’t punch it in, settling once again for 3, to make it 25-20 with 5:49 left. Prince then threw a long pass down the middle that Rosario grabbed WITH ONE HAND, and then Prince polished off the drive by hitting Shaquelle Evans on a quick slant over the middle. Prince then lobbed one up to Rosario for the 2-pt try, putting the Bruins up by 3 with 3:26 left. 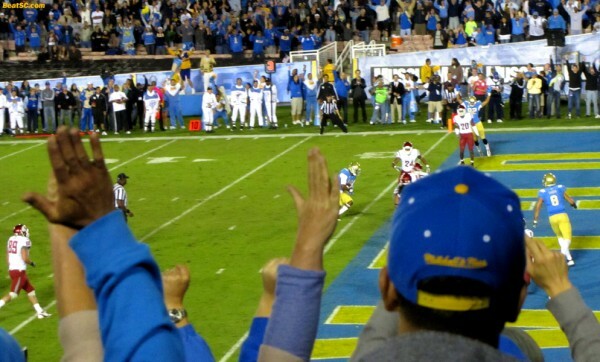 Washington State was a sure thing to get in Field Goal range to force Ovetime, until Andrew Abbott lunged in front of an errant Lobbestael toss. Abbott, who had JUST MISSED on two other near Interceptions, both in the end zone, held on to this one, to put the Bruins in the driver’s seat with about 2 minutes to go. 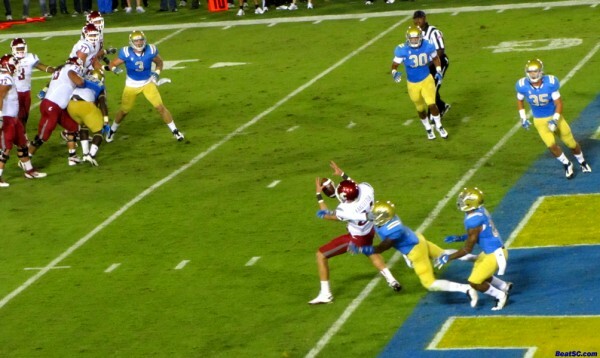 But WSU still had three time outs, so the game was far from over. Of course, that didn’t stop tons of Bruin “fans” from heading to the exits. But the Bruins needed one more 1st Down to ice it. 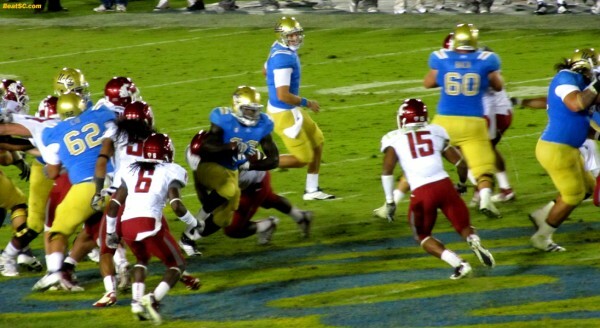 So they ran and ran again, to force WSU to use two time outs, but UCLA did not move the chains. 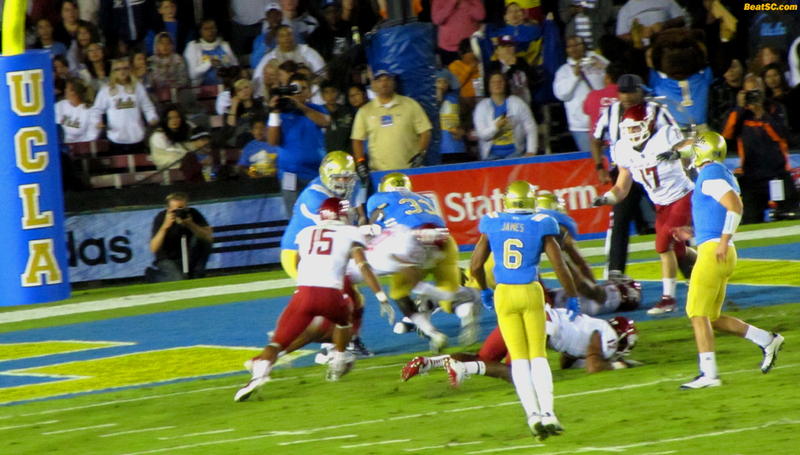 Then on 3rd and 4, there was a controversial false start, making it 3rd and about 9, with about a minute left. 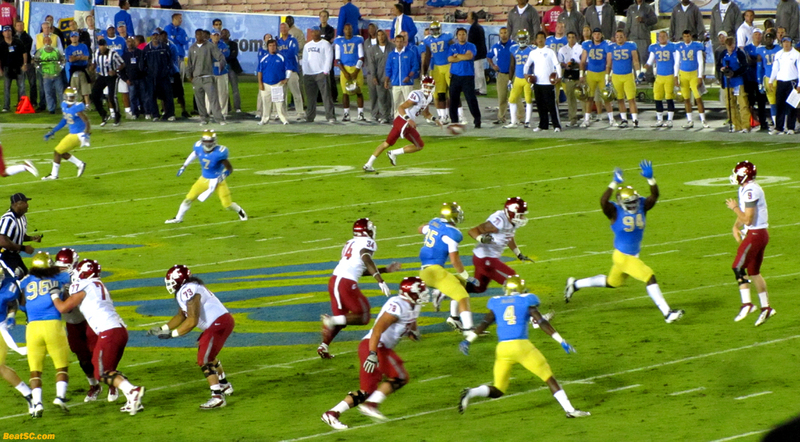 Conventional wisdom, and typical SAFE Bruin thinking, would lead you to believe that they would still try to run the ball, at least forcing the Cougars to use their last time out before taking possession of the ball (after a punt). 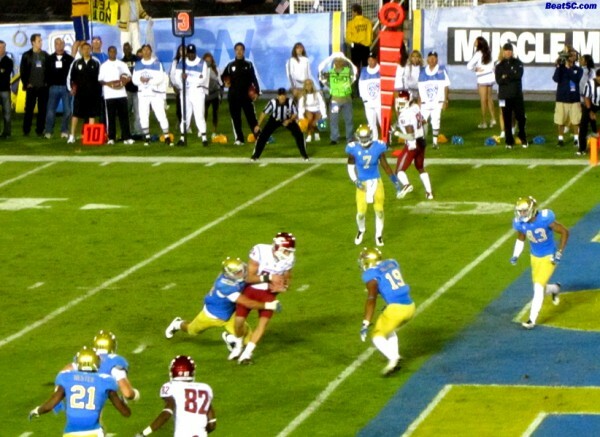 But shockingly, Neuheisel allowed Prince to put the ball in the air, and Kevin came through, firing a bullet to Josh Smith just beyond the marker. Smith was pounded, but held on to the ball at the sidelines, and that killed the Cougs. FINALLY – The Bruins were playing to win instead of “playing not to lose.” And it paid off. 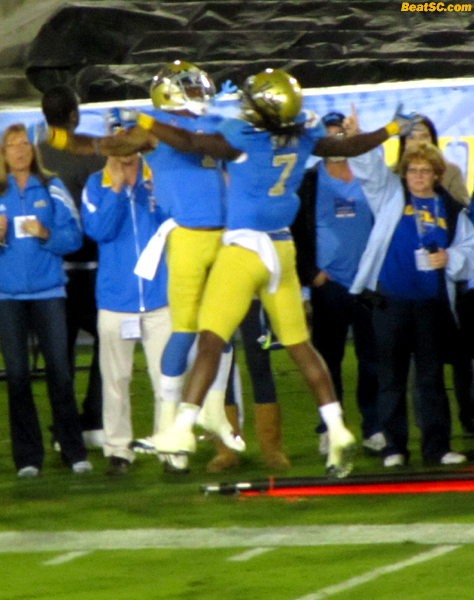 UCLA is now 3-3, and with Arizona losing to Oregon State, whom UCLA already beat, and with Colorado losing badly to Stanford, that’s at least two more games that the Bruins will have a reasonable chance of winning. So… Just like Prince’s demise was greatly exaggerated, I may have buried Neuheisel before rigor mortis had truly set in. He is now (BASICALLY) one upset away from salvaging a Bowl appearance out of this season, and returning next year for another crack at respectability. But who woulda thought two days ago that Kevin Prince would have been his savior?? Below are 35 captioned photos from the game and the pre-game festivities. Click on them to enlarge them. 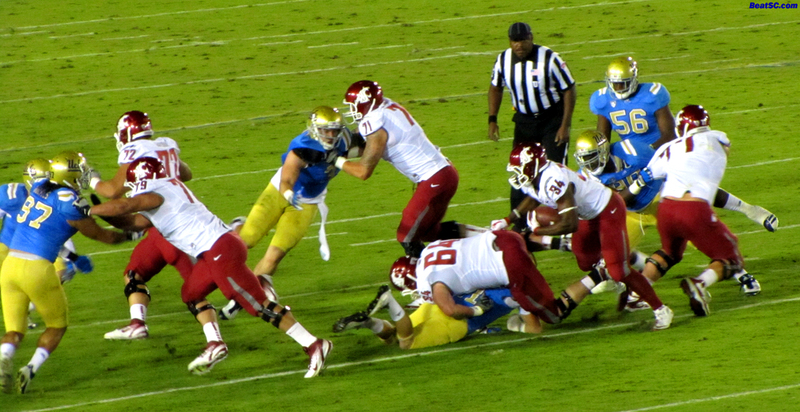 For a change, the bulk of the game photos are in chronological order, so you can sort of follow the flow of the action. 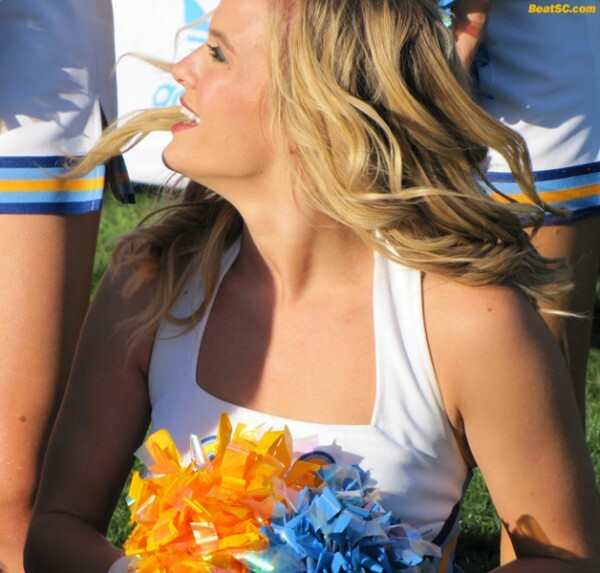 But the REAL action starts when the game pics end, and the Cheerleader shots begin. 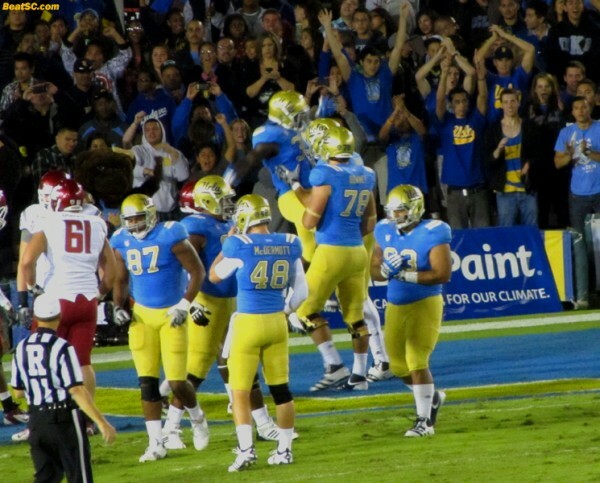 Please enjoy, and SAVOR the victory, and come back soon, as I will be posting MANY MORE Spirit Squad pics very soon. 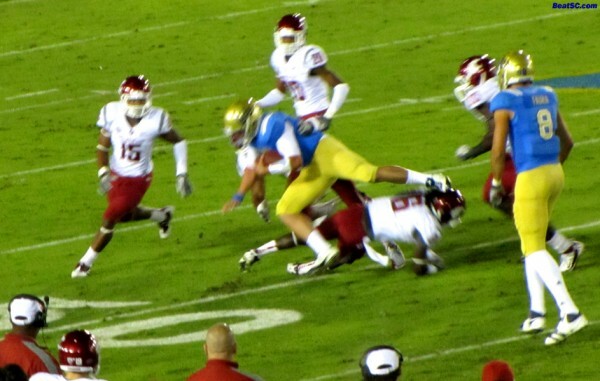 "PRINCE-ABLE OF THE THING" was published on October 9th, 2011 and is listed in Blue & Gold News, UCLA/usc/Cheerleader Photos, UCLA/usc/Sports Photos. Amazing that the Bruins have a shot at a bowl. (If he learns to catch, they’d have a greater chance to get there, of course). Great shots as usual with the alumni band!